' For comments, suggestions and improvements e-mail the author: Floor Anthoni. Researchers say the status of a popular Northland marine park needs to be reviewed because of the damage from recreational over-fishing. Mimiwhangata, 48km northeast of Whangarei, was set up as a marine park in 1984, and is administered by the Department of Conservation (Doc). All commercial fishing, net and long lines are prohibited in the park and regulations imposed on recreational fishers to assist the restoration and preservation of marine life. However, marine conservationist Vince Kerr and marine biologist Dr Roger Grace have recently completed a three-year Doc-funded study of the park and say it is failing. There is a case for claiming that this marine park has deliberately been left to decline by the people who are responsible for its management: the Department of Conservation. Compared to other protected areas, signage is poor and policing almost completely absent. Their work compared the marine habitat, species and kelp forests there today with data from the 1970s. Mr Kerr and Dr Grace have recommended the park be reclassified as a marine reserve. Mr Kerr said their findings were of "surprise and concern". He believed predator removal by major fishing had an impact. "We found things like snapper haven't improved in the park, they have in fact decreased. The decrease of snapper, which are natural predators of kina, has led to an increase in kina which in turn eat the kelp forests and have created what we call kina barren, huge areas of reef where nothing grows," Mr Kerr said. The term used is believe, because these researchers have no proof. If snapper within the park have decreased, there must be something wrong with their measuring method, since it implies that conservation measures have a negative effect. What the scientists fail to mention is that the sea bottom in this area consists of a vast extent of shallow sand, unsuitable as snapper feeding grounds, while also providing little shelter. What they also fail to mention or understand is that kelp beds cannot be expected on rocky reefs ending in shallow sand (see our own discoveries in survey93). In their reports, these scientists are disappointed about the poor return of kina, yet here they claim that kina (as if unpredated by humans) cause kelp beds to disappear. It is bad science. f036002: the urchin habitat or kina barren at Mimiwhangata is not devoid of life. Crayfish numbers recorded in Mimiwhangata were nearly non-existent but where they were fully protected at Tawharanui, 20km north-east of Warkworth, numbers were "spectacular," Mr Kerr said. "The evidence clearly showed that the marine-park status of Mimiwhangata needed to be reviewed. Things are being fished down to a low level and kept there." Doc Whangarei area manager John Gardiner said the current regime had not worked, and he would like to see the area restored to its "former glory". These words are a clear demonstration of DoC's marine reserves policy of lock-up and hope. Comparing Mimiwhangata with Tawharanui is more than just mischievous since Mimiwhangata's almost total dearth of crayfish habitat and sandy shallowness cannot be compared with that of Tawharanui with its deep and broken rocky shore, rich in crayfish habitat, with feeding grounds nearby. Although there is a case for protecting the area directly surrounding the Park and outcrops, it cannot be expected to ever restore to more than it now is. The main reasons are found in its naturally poor habitats and it being on a migratory route for fish. Interested parties would have three months to make submissions on a formal document on the findings, and the future of Mimiwhangata. A decision would then be made whether to proceed with a formal application for the park to be reclassified, Mr Gardiner said. Increased pressure from fishing is behind a proposal for a huge, fully protected marine reserve on Northland's east coast at Mimiwhangata, 50km north of Whangarei. The plan is being promoted by the Department of Conservation and the hapu of Te Uri O Hikihiki for Mimiwhangata, which lies about half-way between Cape Brett and Bream Head. The proposal is to be publicly launched on Monday (12/7) with an informal discussion document starting a three-month community consultation. DoC is calling a formal proposal now a discussion document after which the statutory Application is made. Let there be no doubt: this is the formal proposal which should lead to abandonment of the project in case of overwhelming adverse public reaction, as specified in DoC's own procedure manual. See the process. However, so far no proposal has ever been abandoned, even after overwhelming adverse public reaction. DoC simply won't listen to reasonable arguments and submissions. The term community consultation is still being used to hide the reality, that of a total umwillingness to listen. If a fully-fledged, no-take marine reserve is created with no commercial, recreational or harvest fishing allowed, Mimiwhangata would be one of the biggest marine reserves in the country. It would cover up to 11,200ha (112km2) under one option, or 7200ha (72km2) under another. Under both reserve options, the length of shoreline within the existing Mimiwhangata marine park would be reduced, but the reserve would extend much further out to sea - about 9km on average for the bigger option and 6.5km for the smaller area. In support of the proposal it must be said that a relatively large part of continental sea is covered for a relatively small stretch of coastline. It must also be said that this place still enjoys relatively clear water although severe degradation has already set in while also water quality has deteriorated substantially in the past ten years. The Goat Island marine reserve has shown that in ideal conditions (which are no longer here), an effective marine reserve should cover some 100km2 rather than 5 as around Goat Island. The current marine park, covering about 2000ha (20km2), was established in 1984 and 10 years later commercial fishing was banned together with longlines, nets and weighted hooks. Recreational fishing is allowed with floating lines, unweighted single hooks and spear guns. The 20km2 park has enjoyed intermediate protection for at least 10 years and this should be borne out by observable differences between inside and outside where spearfishing becomes impractical. That scientists do not find these testifies of the presence of a larger threat than fishing, that of degradation from landbased pollution. But studies over the last three years show Mimiwhangata's marine environment, together with snapper and crayfish stocks, has not recovered when compared with survey data from the 1970s. This is not surprising, since the habitats enclosed by the Paark contain little good habitat for either snapper or crayfish. "The comparisons are not good," said Department of Conservation area manager John Gardiner. "The marine park status at Mimiwhangata isn't working." This marine park was designed to provide for recreation rather than complete environmental protection, by allowing most forms of recreational fishing, gathering of shellfish, kina and crayfish, and even allowing all forms of spearfishing. Before claiming that it is not working, all of its benefits must be evaluated first. Likewise, before closing a large portion off forever, the benefits must be weighed against the liabilities such as the loss of extractive recreation and economical losses. Vince Kerr, marine advocate and biologist, said there had been no real change in fish stocks compared with other areas inside and outside marine reserves. Mimiwhangata had low levels of any size of snapper, especially legal size, compared with outside areas and fully protected areas. There was a similar finding for crayfish. "Mimiwhangata is tracking along about the same as other areas with no protection," Mr Kerr said. Mr Kerr has not noticed that the Mimiwhangata promontory attracts fishermen because of the shelter that can be found there and because fish like snapper migrate past. Mr Kerr should also be honest about scientists' reports which mention that some fish species have increased their numbers. There had been no recovery in fish stock numbers while fishing was restricted to only recreational. Boat count surveys over the park summer holiday period showed up to 100 boats a day fishing at Mimiwhangata, reducing to one or two during winter months. "There has to be a concern that there's an increase in recreational fishing pressure," Mr Kerr said. "Mimiwhangata is also home to rare and subtropical species. These include foxfish, combfish, spotted black grouper and tropical surgeonfish. Mr Kerr is a scientist who does not stop at making outrageous statements like these. Rare and subtropical species do not belong here, and the cooler water combined with pollution of recent years has removed them also from protected places like the Poor Knights where foxfish, combfish, spotted black grouper and tropical surgeonfish can no longer be found. (during over 2000 dives, I have never met either tropical surgeonfish or foxfish - FA) They cannot be found in Leigh either, or any other marine reserve for that matter. Marine reserves are simply not going to protect exotic species. 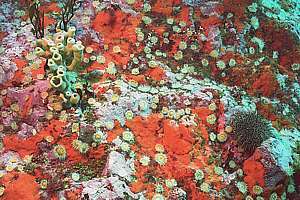 The area has complex reefs with some places up to 100m deep. Recent investigations have shown major marine habitat changes in which kelp forests have been dramatically reduced and kina numbers have grown. The kelp forests are important as nursery areas for many fish. Mr Kerr is referring to flawed marine research done in the Leigh area, extrapolating a myth to Mimiwhangata. The fact is, he has no data to substantiate his arguments. He also forgets the effect of urchin gathering. Read Science Exposed. Mr Gardiner said the fully protected marine reserve concept was favoured because it would adjoin the Mimiwhangata coastal farm park with its camping and native bush walks. "By adding a Mimiwhangata marine reserve, it really starts to hum." A small fully protected marine reserve around the farm park would have merit if access would also be better. At the moment, visitors must leave their cars in a parking lot located at the edge of the park. From there to the first rocky shore is an unbearable distance, particularly for divers who have heavy equipment, typically over 30kg. Even so, due to the shallow sand found all around the park, the underwater experience would be of low quality. For similar reasons the marine reserve would have little educational value. Submissions on the marine reserve proposal close on October 12. The Department will also set up discussions and meetings with iwi, fishing clubs and community groups before submissions close. Mr Gardiner said a decision on whether to proceed with a formal application to create a marine reserve would be made after submissions and community input was assessed later this year. The assessments would consider whether anyone was likely to be 'unduly' adversely affected by the creation of a Mimiwhangata reserve. Oops! This is pure hogwash! Demoiselles are not fished since they are too small for nets, which have been banned anyway, and they do not bite a baited hook. They are not threatened, either inside our outside a marine reserve. Neither are the sponges harvested or threatened. A no-take marine reserve will not provide these with greater protection since also their main threat comes from the land! Ironically, demoiselles are better off outside marine parks where large predators are less common. It is very disappointing that both scientists and a Government Department are tempted so easily to abandon the truth in favour of lies and deceiving the public. Forest and Bird today welcomed the proposal by the kaumatua of Te Uri O Hikihiki hapu and the Department of Conservation for a Marine Reserve at Mimiwhangata. "This coastline is incredibly valuable for the Northland environment and economy", said Forest and Bird's Northern Conservation Officer, David Pattemore, "It's great to hear about this latest proposal for protection of Northland's unique coastal ecosystems". "There are a number of features on this coastline that now highlight it's international importance", said Mr. Pattemore, "including the recently announced 'worlds-first' exclusion zone for large vessels, and the world-renowned Poor Knights Marine Reserve. This signals that the coastline of Northland is set to become the most important resource for the future economic, social and environmental well-being of the region. Marine Reserves will have a crucial role in this future". It is sad to see F&B's support for what are largely undemocratic decisions inflicted on the NZ public. The large vessel exclusion zone has never been discussed broadly or voted on and the Mimiwhangata marine reserve follows public consultation only in name, as have all other marine reserve proposals in the past. These people so easily espouse economic benefits without any economic analysis in support. "With this proposal, the people of Northland and visitors will be able to see spectacular marine life as it once occurred around our whole coastline, without having to travel all the way down to Leigh", he said. "The area proposed is currently managed as a Marine Park with a number of fishing restrictions, but several scientific studies have shown that this has not been able to prevent further losses at the park." A marine reserve in what used to be the last remnant of clear coastal water, deserves merit, and the Rimariki island close to the coast resembles the situation at Goat Island somewhat. However, this area is awash in sand, with large open beaches and very little rocky shore within easy access. It is also more exposed than Goat Island, limiting the number of days suitable for education. It will therefore not offload the Goat Island marine reserve and those who propose it will be in for disappointment in this respect. Scientific reports have shown both gains and losses in marine life. "The reality is that the larger predators are still being taken out in significant numbers, leading to flow-on effects in the whole ecosystem", said Mr. Pattemore. "Marine reserves provide a unique opportunity to protect whole marine ecosystems, so that we can see what our marine life used to look like", said Mr. Pattemore, "they are also crucial for our understanding of fish biology and ecology that will help guide management elsewhere." "The vast majority of Northland's coastline is open to exploitation by whoever, whenever, however", said Mr. Pattemore, "These reserves are sign that we are starting to think wisely about providing for future generations and that we recognize the importance of marine life."